Hey, you're back! Did you have fun? Good. Now, where was I? 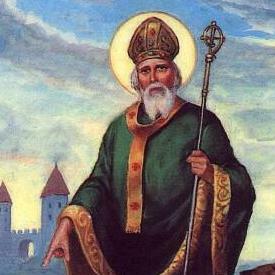 Oh yeah, St. Patrick! What was his deal? He was Irish, that much I know. Wasn't he the guy who led all the children out of town with his flute? Oh, no, that was some other guy... okay, I have no idea then. Maybe it was snakes? To Wikipedia, I go! Let's see now, so it turns out that Saint Patrick wasn't Irish! I know, right? It's not known exactly where he was born, but it was definitely either Scotland, Britain or Wales. He was actually captured by Irish marauders when he was 16 and sold into slavery, the poor little guy. He was sold to some Druid dude named Milchu, and little Paddy (oh yeah, his name wasn't actually Patrick, it was Maewyn Succat, but for our purposes, we'll refer to him as Pat) was his slave for 6 years, until finally being told by an angel to run away, he escaped (on literally, a wing and a prayer) and headed on a boat back to Britain. Now, during his time with the Druids, Pat got really into God. He prayed a lot. I mean, it's not like he had much else to do while he was out in the fields all day tending his master's flock (let's just hope all he did all day was pray...). He also learned the language and traditions of the people of Ireland, and decided it was about time those barbarians got some God in them. So, when he got home he went immediately into the priesthood, and then started gunning for a posting in Ireland, so that he could return to convert the pagans. He eventually did get sent back, and the first thing on his list of people to see and things to do was to find Milchu and give him a piece of his mind. Apparently, though, he didn't want revenge, he just wanted to save the guy's soul. Milchu got wind that his slave boy had returned and was looking for him, so he just went ahead and killed himself. Seriously. Seems a bit extreme, doesn't it? He was either really scared that Pat actually wanted revenge (and so, I imagine this Milchu character must have been a pretty cruel guy) or, he just really didn't want to have to listen to any of Pat's proselytizing (and I mean really, who could blame him?). So, after that little setback, Patrick continued his mission to convert the Irish to Christianity. For someone who ended up becoming their patron saint, he sure wasn't treated too well while he was there, often getting beaten, robbed, and probably nearly executed! Not to mention that nasty little detail about the kidnapping and slavery... which is probably why Patrick believed that owning another human being was, you know, like, wrong? And that actually caused a bit of tension between him and the church, which took another 1000 years to get around to condemning slavery. Anyways, judging by Ireland today, Patrick was pretty successful. It is pretty ironic (maybe more like in an Alanis Morisette kinda way, though) how he's celebrated around the world today, though. I'm pretty sure he wouldn't have been totally cool with the drunken belligerence and public urination that one usually encounters on March 17th. My worst experience with St. Paddy's Day was taking a vomit-smeared bus home at 2am. Literally, the floors, seats, and poles were covered in vomit. Where was my luck o' the Irish then, huh? Rebekah Hakkenberg is a curator/writer/photographer living in Toronto. She is also the co-creator of Once Again, To Zelda, which is where an earlier incarnation of this post originally appeared. Do snakes and giraffes in zoos count?